Bio: Anthony Davis was born on Long Island. Proximity to the ocean all his life has influenced his artistc direction. A physical therapist by profession, Anthony eschewed a formal education in the arts. He discovered early that pastel was his preferred medium, but he has also recently taken up plein air painting with oil. 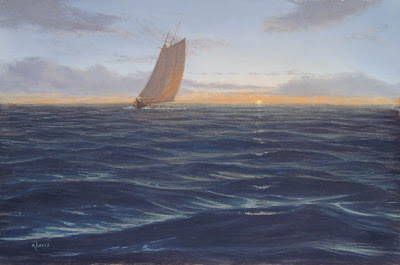 He has attained Signature status in the American Society of Marine Artists and has also been elected Artist Member of The Salmagundi Club, where he was asked to perform a seascape demo earlier in 2009. Navigation: A certificate in navigation is not needed for this site, however appropriate! Main menu remains accessible at top of page at all times. Gallery: One page of thumbnails, with title, medium and dimension. Image View: Each thumbnail enlarges on a new page. The enlargement is very generous and can be saved. Use the PC’s return button to return to gallery, or use the right click open link in new tab/window option for each thumbnail to keep the gallery page active. Blue Water Solitude is 8x12 ins. 1000x663, 100 KB – some of his images are over 200 KB!